SMBs report an average of over 50 hours of lost productivity per employee per year due to IT problems. 93% of IT problems can be proactively addressed via remote administration before they turn into performance problems, downtime, loss of data or security breaches. 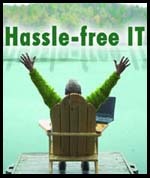 Current IT support providers profit when you face more IT problems rather than less !!! Managing and troubleshooting desktops, networks, servers and IT security is rarely seen as a core activity by SMBs. Some of the questions which come to your mind are like- Does hiring a full time IT support specialist make sense? Can I pay a predictable monthly price rather than being at the mercy of IT support charges paid by the hour? How can I reduce downtime, poor performance and IT security breaches without paying through the nose? Relax! You are not alone. Paris Tech Works believes in proactive monitoring and preventive maintenance. We work towards making your systems work optimally. It sets you free from all the worries of cost and downtime and allows you to focus on your core business. You get affordable bills delivered consistently. Is your data safe? Are you sure your backups really work? Would your business survive a fire, tornado, hurricane, earthquake or even a simple server hardware failure? Having any doubts? Call Paris Tech Works and we will make sure you can confidently answer yes to all of these questions. Built-in archiving to rid yourself of costly tapes, offsite storage facilities and downtime while waiting on restores.